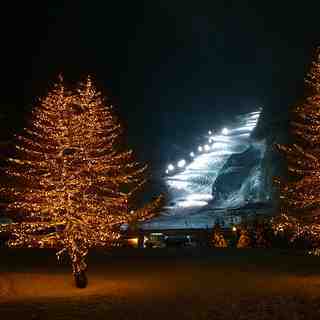 Is it snowing in Val d'Isere ?¡Gracias! Val d'Isere, in the Savoie area of France, is a colourful winter sports haven that began as a farm community in the years BC. 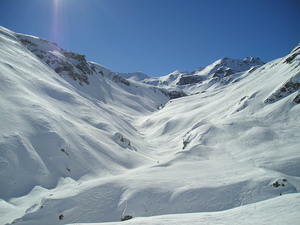 It is the better-known part of Espace Killy. 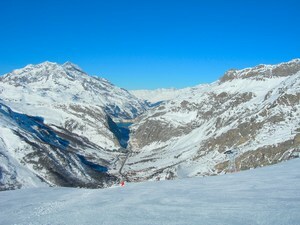 The huge skiing domain, shares itself with purpose-built Tignes. The area is named for Olympic hero Jean-Claude Killy, who grew up in Val d'Isere. The charming village finds its 1,800 residents outnumbered 15 to one by guests in winter. 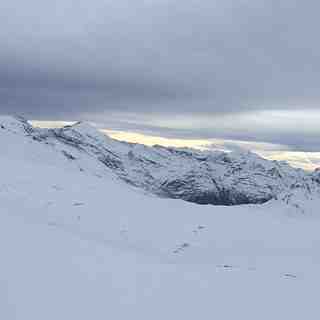 Espace Killy has 300 kilometres of maintained slopes cut through vast snowfields that stretch to the horizon. Ninety-nine lifts can move more than 135,000 skiers an hour, uphill. Much of the terrain is ideal for cruisers, but there are many opportunities for snowboarders and powder skiers to show their stuff. A lot of skiers accept the challenge of the Bellevarde downhill, designed for the 1992 Olympics. Some parts of the 915 metre drop have a 63 percent angle and running it earns bragging rights in the lively Val d'Isere apres-ski scene. Returning this year for at least the 20th time. For skiing (as opposed to boarding) Val is simply the best all-round resort for all except beginners (see below), and the apres, the bar scene and the restaurants are legendary. The lift system and bus services are also superb, giving easy opportunity to cover all areas of the Espace Killy. 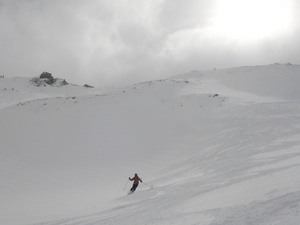 For on-piste skiing, advanced and intermediates will never run out of variety. With excellent links all across the vast area from the left edge of the map with crisp corduroy on the lovely Fornet glacier area in the morning. All the way over to the extreme right of the map with the superb very long (partially) black "Sache" from up at the Aiguille Percee all the way down to Les Brevieres. My only warning would be to beginners and intermediates of a timid nature. Val is a fairly challenging resort with a huge variety of reds and blacks. This, in my opinion, has resulted in the deliberate down-grading of some fairly difficult reds to blue status in order to get the right colour balance on the piste map and to encourage families and beginners who would otherwise be put off visiting. Some of the blues in Val would definitely be graded red in most resorts. This can result in unwelcome and exhausting problems for some less able skiers getting down back to resort at the end of a hard day, especially if conditions are poor. I can't comment on the off-piste, but for piste skiing it's 5* for advanced and intermediates, 2* for beginners, and probably only 2* for boarders, who are not made welcome here and have largely stopped coming in the last couple of years. We can't stay away and will keep coming year after year.